Posted on Wed, Jan 11, 2012 : 6:40 p.m. 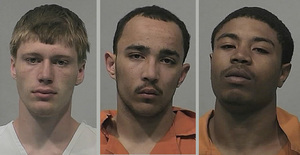 The three men who police say beat and robbed a pizza delivery driver in May will be heading to prison after being sentenced by a Washtenaw County Trial Court judge on Monday. Michael Brooks, 18, Michael Hellem, 19, and Robert Word, 21, were sentenced by Washtenaw County Trial Court Judge Melinda Morris. The three men all entered pleas in their cases in December, according to court records. Michael Brooks, left; Michael Hellems, center, and Robert Word. The three men were accused of approaching the pizza driver at 1:46 a.m. May 22 in the 200 block of Ashley Court as he made a delivery. According to police, one of the men pulled a gun and attempted to rob the man. The driver fought back against the men, who punched and kicked him, according to police. The 56-year-old man from Van Buren Township was badly beaten and was taken to St. Joseph Mercy Hospital, according to police. It was unclear what was actually taken from the driver. Word received the most serious sentence and will serve a prison sentence between three years and one month and 10 years for pleading no contest to a charge of assault with intent to do bodily harm less than murder and three years and one month to15 years for pleading no contest to unarmed robbery, according to court officials. Court officials were not aware if the sentences were to run concurrent or consecutive Wednesday. Brooks will serve between a year and a half and 15 years in prison for pleading guilty to a charge of unarmed robbery, according to court officials. Hellem will serve between a year and a half and 15 years in prison for pleading guilty to a charge of unarmed robbery, according to court officials. Fri, Jan 13, 2012 : 9:54 a.m.
Hopefully, by they time they get out they will have learned that leaving a witness is a mistake. Fri, Jan 13, 2012 : 4:17 a.m. Revolving door justice. These thugs will be back on the streets in a very short period of time, and will turn back to their life of career criminals. Unless these sentences are much longer, these violent thugs will be back in town committing mayhem in a year or so. Fri, Jan 13, 2012 : 1:57 a.m.
Fri, Jan 13, 2012 : 1:54 a.m.
Get them off the street and keep them off. Don't coddle the criminals. If you want to prey on others plan on being preyed upon in prison. Thu, Jan 12, 2012 : 6:57 p.m. In regards to The Black Stallion 3 comments: I have read your replies and note that you stated I should embrace all Americans. Since it is clear that I am not as patriotic or as righteous as you......... what should i do with folks that are not Americans? Just wondering. Gives you something to think about doesn't it? What order would you like these pictures if all three are not from America.....................who then should be listed first? Perhaps you would prefer I shuck and jive and shuffle myself back to where I belong or at least remember my place. Thu, Jan 12, 2012 : 11:23 p.m. I do believe you have done enough shucking and jiving for today.............cool your heels and enjoy the evening. Thu, Jan 12, 2012 : 5:46 p.m. I am most certain that the people you refer to as &quot;jerks&quot; would not care to be around you either. Try to embrace your fellow Americans without all the prejudice, your world will be a much better place.......I hope you have a fine day. Thu, Jan 12, 2012 : 4:45 p.m.
Thu, Jan 12, 2012 : 4:42 p.m.
Once again, I disagree with wording here. Once these men are convicted (by plea in this case), you should drop words like &quot;police say,&quot; &quot;allegedly,&quot; accused,&quot; and so on. You no longer have to tiptoe around their possible guilt or innocence. It's been established. The wording shouldn't be, &quot;who police say beat and robbed a pizza delivery driver,&quot; but rather, &quot;who beat and robbed a pizza delivery driver.&quot; (Actually, the first sentence should have read &quot;whom police say ... ,&quot; but that's for another time.) Similarly, &quot;The three men were accused of approaching the pizza driver at 1:46 a.m. May 22,&quot; should just be, &quot;The three men approached the pizza driver at 1:46 a.m. ...&quot; At least that's the way I learned it 45 years ago at U of M back when they had a Journalism Department. What is annarbor.com's policy now? Thu, Jan 12, 2012 : 7:24 p.m. It's included in the paragraph explaining Robert Word's sentence. Thu, Jan 12, 2012 : 6:33 p.m. Thanks for the clarification, Kyle. I agree that that is the proper way to go with a no-contest plea. That detail would have been informative in the body of the story. Jeff, the reason I went with that wording is because one of the men pleaded no contest. While for legal purposes he is not fighting the charges and is sentenced as if he pleaded guilty, for civil purposes he is not admitting his guilt. I felt it was best to limit the chance that I could be sued for libel in this case. Thu, Jan 12, 2012 : 3:06 a.m. I see three men in that photo and I only see the black male as the main picture in the headline of this story. It's only when i click on the story that i see all three men. Why is AnnArbor.com headlining this story with the dark skinned, black man's picture? Thu, Jan 12, 2012 : 4:23 p.m.
Kyle..........You do not have anything to apologize for, all three are Americans and that is the most important thing about them. Thu, Jan 12, 2012 : 4:19 p.m.
Sami- When I originally uploaded the photos, I uploaded each mugshot individually. The first mugshot is automatically loaded into the photo slot for the front page of the site. Before publishing, I realized that all three mugshots would have run past the length of the article, so I combined them into one photo of all three. The mugshot that was originally uploaded first remained in the photo slot for the main page. Thu, Jan 12, 2012 : 1:45 p.m. Sami.....It is people like yourself that are causing these young people to act like they do, stop giving them excuses and start giving them encouragement before they become hoodlums. Thu, Jan 12, 2012 : 1:32 p.m.
Stop looking for racism where none exists. Read the article. Thu, Jan 12, 2012 : 3:29 a.m.
Oh idk, maybe because he was the most violent and received the most severe sentence of the three. What exactly are you getting at anyway? Wanna start looking at statistics? I thought not! Oh by the way, there has already been 17 homicides in the first 11 days in the city of Detroit. Thu, Jan 12, 2012 : 1:55 a.m.
Just curious. Why is it that the only picture posted on the main page, is of the young black man, when he is the third picture in the article? Why not either put all three (which by the way are not all black) or none at all? Seems it would have been just as easy to post the white guy! Thu, Jan 12, 2012 : 4:18 p.m.
Beth - When I originally uploaded the photos, I uploaded each mugshot individually. The first mugshot is automatically loaded into the photo slot for the front page of the site. Before publishing, I realized that all three mugshots would have run past the length of the article, so I combined them into one photo of all three. The mugshot that was originally uploaded first remained in the photo slot for the main page. Thu, Jan 12, 2012 : 1:47 p.m.
Beth........please find something better to do with your time than trying to start a race problem..we already have enough of that. Thu, Jan 12, 2012 : 2:01 a.m.
Perhaps since he was the one who received the harshest sentence due to the assault charge on top of the unarmed robbery charge. Well, at least these 3 aren't on the streets, and will spend some amount of time in Prison. Hopefully the 56 yr. old delivery man has fully recovered. Thu, Jan 12, 2012 : 1:20 a.m.
People are always screaming to let &quot;non-violent&quot; offenders out of prison because they can be rehabilitated and it costs the taxpayers too much money. I can't wait to hear the &quot;rationale&quot; behind some of the future comments as to why any of these cowardly punks should be released earlier than the maximum time (which I'm very sure none of them will end up serving). Kyle, do you have any information on the current status of the assaulted driver? Not that there should be any need to justify keeping them behind bars as long as possible, but if the driver has suffered chronic physical injury (chronic psychological injury is probably a given) then any keys to their cells should be &quot;lost&quot; for the 15 years allowed. Thu, Jan 12, 2012 : 12:03 a.m. The headline should have also disclosed that two of the defendants have minimum sentences of 18 months and the third has a minimum sentence of 37 months. The trio have spent almost eight months in jail already so two may be released in less than a year. It is very likely that the third chap may get out in less than 30 months. Not a real pro-prosecution sentence. This was, in reality, less than Melinda's only tough sentence - of militia advocate Mark Koernke - who served five years in prison for running away from a state trooper. But Koernke's politics may have been a factor. Melinda will e retiring on 12/31/2012. Thankfully. Fri, Jan 13, 2012 : 4:14 a.m. Thank goodness Morris is on her way out! Thanks for the update. Let's get someone in her spot who will actually give sentences that fit the crimes. Thu, Jan 12, 2012 : 2:35 a.m.
Jim Fink, Carol Kuhnke, and Steve Postema are announced candidates for the two at-large circuit court seats up for grabs in 2012. Melinda Morris and Timothy Connors, both of Ann Arbor, are the two current officeholders. Thu, Jan 12, 2012 : 2:25 a.m.
Watch out for her replacement.